Why russian players like this game more than us? I realized that they had a childhood much richer than ours. And you can notice that it is much lighter and loose and soft .. their rules. You can confirm through their children's idols. Enjoy it. I even believe there is a God now!!! It seems like the Russians believe that the father should also participate in the watching of these kids' shows. If I wasn't a girl then I'd certainly be into it! Zoom on target button isn't working, anybody else with the same problem ? Why do we have snail for Russian decals?? I don't want to know how Mac found that. My friends sent this to me in whatsapp, called "Russian Xuxa"
Xuxa was a children's idol too. She is born in the city near to my city. She had a bad time cuz was found a very dirty tape in brazil with her doing you what. Now I know why so many grown men were watching with me. OMG. If I was 9 years old watching this I would have been perky. You need to come to Brazil and raise your son here. He will thank you in the future. I just did a Google research for "Brazil reasons to visit"
Bahahahahaha!!!! Good stuff Mack. Excellent research. Hey it's 37 degrees C. here today! We have summer covered. Do you have summer like this? So hot like this? This was in the premium time in Brazil most famous tv show, an advertisement. Memorial Day a few years ago here. It was in the 80's but the ice had been held into shore by a steady north wind so it didn't melt. I live in Philadelphia, where it's 95F one day and then 50F the next. then back to 100F after that. Very nice, looks like peacefull. Come to Brazil and your ice will melt very easy. South Brazil is like this. We have snow at night in the winter, but during day you can use t-shrit. It was gone a few days later when the wind shifted and pushed it out into the lake. 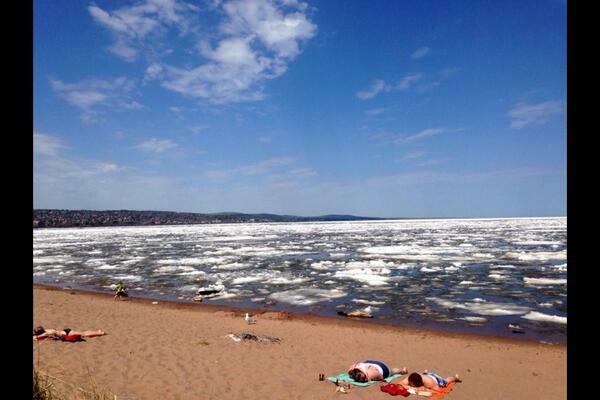 Even as cold as lake Superior is the ice doesn't last long when spread out. Edited by Rockstone_, 08 July 2016 - 10:09 PM.